We provide Concrete, Plastic, and MASS barriers for projects across the country facilitating both traffic and pedestrian flow, also providing security for sites and vacant properties. Maltaward are suppliers of a range of best quality barriers with a wide range of applications and uses. Typical uses include traffic management, keeping trespassers out of vacant sites, blocking vehicle access, securing building sites and other private spaces. Our professionals will be able to advise you on which system will best suit your needs, wether a single barrier or the installation of a complete barrier system. 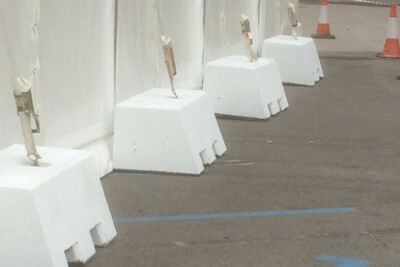 Our barrier configuration can be modified to suit our clients bespoke requirement for many sites. Can concrete barriers be stolen or moved? All of our heavy-duty barriers are exceptionally difficult to lift or move, requiring special machinery to install and remove them. Without the proper equipment, it would be very difficult to lift them or push them aside. If you are particularly concerned about the vulnerability of your site, give us a call and we can discuss the most secure fencing or barrier options. Will Maltaward deliver my barriers? Not only do we offer delivery of all of our products, but unlike other firms, we take care of this delivery with our own representatives, in our own specialist vehicles. This means that you’re guaranteed to have your barriers delivered by someone that knows what they’re doing, and you won’t need to deal with third-party couriers if you have any queries or short-notice requirements on the day of delivery. Can I collect my barriers from Maltaward? If you only require a small number of blocks then you may prefer to collect them yourself. We would be happy to help you load your vehicle – please get in touch and we will arrange a convenient date and time for collection. We also offer HIAB hire if you do not already have the specialist equipment to position your blocks. How many blocks do I need to create an effective barrier? This will depend on the type of fencing or blocks that you choose and the requirements of your site in terms of safety and access. For example, placing blocks intermittently should prevent unwanted vehicle access but pedestrians will be able to walk between them. A low-level barrier such as TVCBs or Malta XL Lego Blocks will make it clear the access is prohibited but a mesh or hoarding panel will stop people from simply climbing over. You should check that your insurance policies cover you for theft or damage, and you should also make sure you have adequate liability coverage in case the positioning of your barrier inadvertently causes inconvenience and someone claims against you. When you work with our team at Maltaward, you are getting over 30 years’ experience in civil engineering and over a decade of first-hand knowledge about concrete barrier manufacture. We are committed to delivering a fast and friendly service, providing every client with recommendations tailored to their needs and budget. Our operations are accredited to ISO 9001 and FORS Gold standards, with additional approval from industry bodies such as Heathrow Airport, Gatwick Airport, local authorities and major property managers.